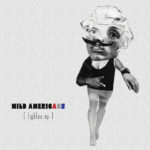 Groove to the pessimistic power pop of “I Wanna Take You Home” from New Jersey trio Wild Americans. The lead single from the band’s forthcoming debut EP, Lighten Up, “I Wanna Take You Home” is a jangling ode to unrequited love set against a cinematic suburban idyll in the video directed by Charlie Chalkin Productions. The four-song Lighten Up will be released on 9 September. Watch the video for “I Wanna Take You Home” below and pre-order the EP via Bandcamp.